It took less than five years for the Apple iPhone to forever influence the way we consume and relay wide varieties of content. Shining light on the phenomenon of acquiring programs in the form of ‘Apps‘, Apple and its competitors now host a gigantic industry devoted to creating solutions to problems we never even knew we had. A Nielsen survey reported that 55 billion apps have now been downloaded to smart devices so far. The first major automaker to foresee in-car infotainment as an experience that should be similar to operating a smartphone or tablet, Ford Motor Company’s SYNC brand technology is currently boasting one of the richest assortments of on-line applications. While Toyota, General Motors, Mercedes-Benz as well as most recently Subaru have just started to dip their toes into a pond of app-driven vehicle entertainment and services, the potential could see the still small body of water turn into an ocean in a matter of years. The trick to integrating apps into automobiles is realizing technology’s fine line between aiding and distracting the driving experience. 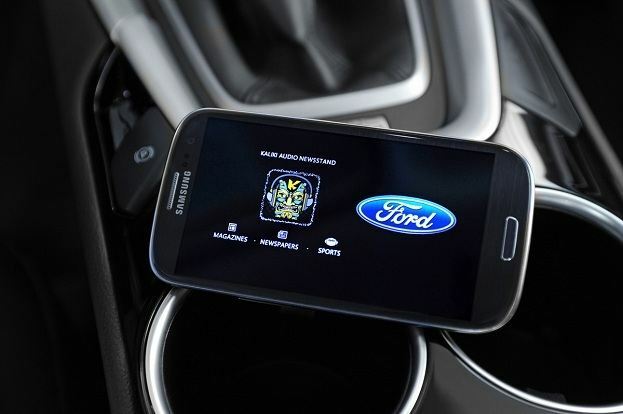 Ford’s initiative to collaborate and create the electronic mechanisms for controlling apps has led to voice prompting as well as Bluetooth connectivity. 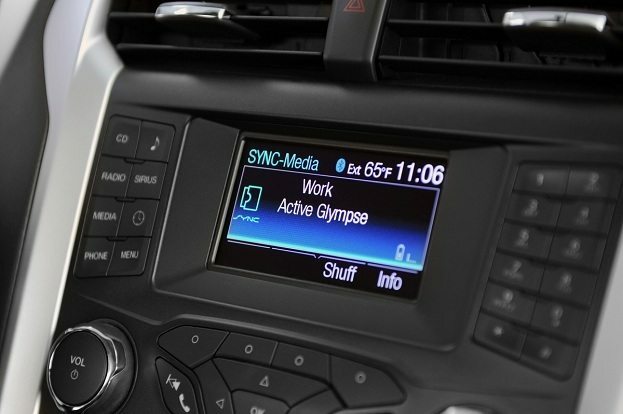 Ford SYNC AppLink allows select apps to be accessed hands-free. At the 2013 International Consumer Electronics Show (CES), Ford has a pile of new apps that can operate on their voice-operated SYNC AppLink system to cater what is now over a million vehicles and counting. 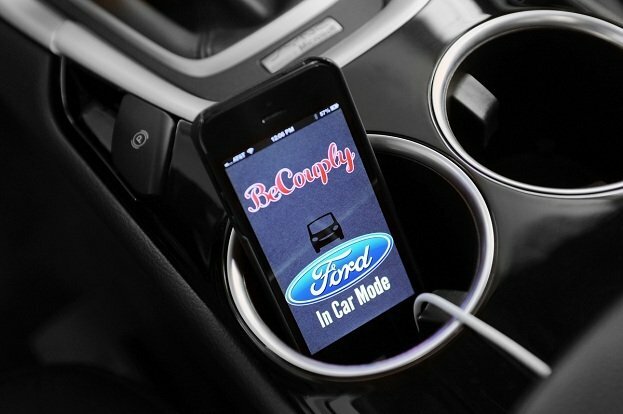 A new Ford SYNC AppLink tailored app premiering at the 2013 CES, BeCouply is an interactive program suited for couples. Developed by real-life couple Becky Cruze and Pius Uzamere, the app was he winner of Ford’s annual SYNC AppLink Developer Challenge at the TechCrunch Disrupt Hackathon event. Receiving the Ford SYNC AppLink spotlight in Las Vegas as a prize for their award, BeCouply brings voice-controlled date planning. Helping couples develop a night out near spontaneously, BeCouply will respond to queries on where to take in activities or settle down to a nice meal. One of the more popular on-line, on-demand music sites on the Internet, Rhapsody streaming content is already listened to by 40 percent of users while driving. Now adding the functionality with Ford SYNC AppLink, Rhapsody wide library of content can be enjoyed in almost complete safety. With a base of more than one million regular users, Rhapsody streaming radio, downloaded music playlists and audiobooks can be summoned through hands-free operation in Ford SYNC equipped vehicles. Also announced this new year, Rhapsody will be joined in the Ford SYNC AppLink forefront with similar competing apps Aha by HARMAN and Slacker radio. If we were to believe the idyllic image of American life portrayed on 1950s television shows such as “Leave it to Beaver“, people used to sit down to read the morning newspaper prior to a trip to work. 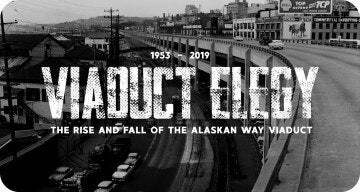 With longer commutes part of today’s world, a brief newsbreak from television or radio is about all the time we have to update ourselves on events during the working weekday. When driving a Ford SYNC AppLink product, downloading the Kaliki app onto your smartphone provides newspaper and magazine content on the go. In essence, an on-line audio newsstand, Kaliki’s debut at the 2013 CES brings meaningful news stories to drivers for free. Titles such as OK!, TV Guide and Shape Magazine are available at launch with promise that additional titles will be added to the Kaliki library soon. Another news app added to the Ford SYNC AppLink system is related to USA Today. Just like Kaliki, USA Today headlines will be dictated to occupants of an equipped Ford vehicles and can be navigated through voice commands. How many times have you waited in cold and/or wet conditions for a ride to come? Frustration builds when a driver may be running late towards a pick-up destination. It is not as much an issue that the person is late, rather why we must be left in the freezing cold waiting for them. One Ford SYNC AppLink enabled application will provide helpful notification. Sending a real-time update on a location to a friend or family member, Glympse is a solution that conveniently relays an accurate connection between parties through an app. Needing only a tough of the SYNC button to commence, a driver’s voice prompt “send a Glympse” will notify specified others through Twitter, Facebook, and email or through a mobile phone number. Once sent, a Glympse notification will provide a recipient with an up-to-date account on whereabouts of the other member of their party until a set time limit is reached. Despite a popular song from the late 1970s decrying that Video Killed the Radio Star, the listening experience of an audio broadcast remains part of driving. The difficulty regional radio stations are encountering at this time is trying to stay relevant in an app-driven environment. Competition from Internet radio is also a concern leading to some terrestrial broadcasters to seek integration. 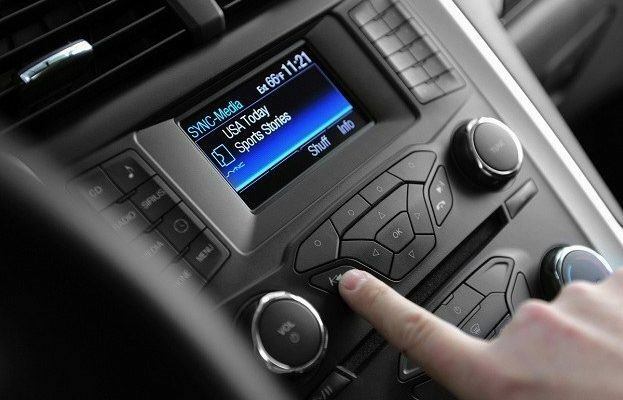 Owner of 22 radio stations in major American markets such as Boston, Detroit and New Jersey, Greater Media has developed a solution it is eager to share with Ford SYNC owners. A collection of apps represent 16 of Greater Media’s radio properties, each one connects directly to live streaming. Free downloadable apps for Apple IOS and Android devices, the Greater Media apps can be operated through voice command on Ford SYNC by saying “Play stream” or “Stop stream”. Podcasts are even accessible by stating the name of specific programs. Following Ford’s 2013 Consumer Electronics Show presentation highlighting their most recent products added to the SYNC AppLink library, its fair to say if other auto companies want to pass the Blue Oval, they’ll have to catch up to them first. 2 Comments on "Ford SYNC Becomes App Happy at 2013 CES"
Its great that Ford is making so many apps, they are widening their market and this act allows other car companies to think outside the box as well. Ford isn’t actually making the app; the apps are simply compatible with Sync. It’s great that people have options of installing the ones they want as long as its not overly distracting.